I enjoy working on projects that mix art, engineering, science, and the occasional flame tornado. Here are some examples. Dr. Brainlove is a climbable, interactive, 15 foot tall brain jungle gym mounted on a modified school bus, with lighting controlled by EEG and neural models. It combines educational outreach, a 3d printed space frame, and computational models of the brain into one loveably crooked-eyed vehicle. Check out the Indiegogo page, and the Facebook group. Dr. Brainlove in her natural habitat, Burning Man 2014. Photo copyright Matt Bell. Syzygryd is a multi-ton musical instrument played collaboratively by three people. More information (and gorgeous pictures) at http://www.syzygryd.com/. Syzygryd, Burning Man 2010. Photo copyright Michael Broxton, https://www.flickr.com/photos/broxtronix/4981908410. A video of an early flame tornado test for Syzygryd. Developing this was a great deal of fun (though the final product was frustratingly sensitive to wind). Stand in the middle of a ring of flame effects, and feel the heat as they pulse in time to your heartbeat! Check out the False Profit Labs Facebook group, and Flickr. Pyrocardium, Coachella 2009. Photo copyright Rasmin, https://www.flickr.com/photos/rasmin/3471190025. I no longer know the source of this image. Email me if it's yours! 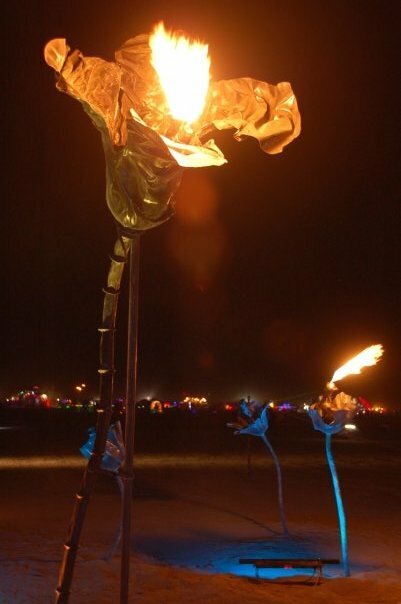 Fire breathing flowers made out of molded carbon fiber. They answer the question, "What would grow on playa soil, if anything could?" Grad school would be incomplete without building a Ruben's tube, and testing it ... indoors? See standing waves made out of flames.